Back cover blurb: Thirteen years ago someone did something very bad to Anna. Now it’s her turn to get even … Anna lives a solitary existence, taking solace in order and routine. Her only friend is the lonely old lady next door. She doesn’t like to let people to get too close – she knows how much damage they can do. Then one ordinary day Anna witnesses a devastating road accident and recognises the driver as Carla, the woman who ruined her life all those years ago. Now it’s Anna’s chance to set things straight but her revenge needs to be executed carefully … First she needs to get to know Liam, the man injured in the accident. She needs to follow the police investigation. She needs to watch Carla from the shadows… But as Anna’s obsession with Carla escalates, her own secrets start to unravel. Is Carla really dangerous or does Anna need to worry about someone far closer to home? Safe with me, is what some might call a disturbing novel. Take one very unreliable narrator in the form of postal worker, Anna. Add a road traffic accident and some very suspicious behaviour and you get a brilliant psychological thriller. From the outset of 'Safe with me', it's clear that there something not quite right with Anna. Is it just anxiety, has something happened to her in the past, or is she just really unreliable? When she witnesses a road traffic accident and befriends it's victim, Liam, it seems that being there for him, is helping Anna's inner turmoil. But the woman who caused Liam's accident is a woman from Anna's past, one she was convinced that she would never set eyes on ever again. Anna is convinced that she is going to get away scott free with hurting Liam and determined that it shouldn't happen and that justice must be served. But despite her best intentions Liam's Gran, Ivy is suspicious of Anna's behaviour, yet welcoming to the woman who nearly killed her Grandson. As Anna becomes more desperate and her behaviour becomes more erratic all she needs them both to understand that she has their best interests at heart - but just who is she trying to protect them from? 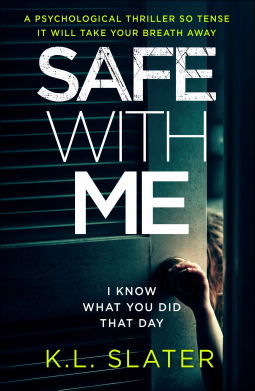 Safe with is available now via Amazon online and all good book shops.